Scientists have developed a drug capsule that could be used to deliver oral doses of insulin, paving the way for replacing the painful injections that diabetics have to give themselves every day. About the size of a blueberry, the capsule contains a small needle made of compressed insulin, which is injected after the capsule reaches the stomach. In tests in animals, the researchers showed that they could deliver enough insulin to lower blood sugar to levels comparable to those produced by injections given through skin. The study, published in the journal Science, also demonstrated that the device can be adapted to deliver other protein drugs. 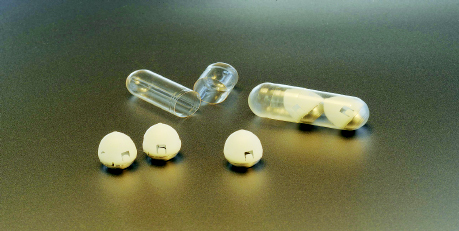 “We are really hopeful that this new type of capsule could someday help diabetic patients and perhaps anyone who requires therapies that can now only be given by injection or infusion,” said Robert Langer, from the Massachusetts Institute of Technology (MIT) in the US. The tip of the needle is made of nearly 100 per cent compressed, freeze-dried insulin, using the same process used to form tablets of medicine. The shaft of the needle, which does not enter the stomach wall, is made from another biodegradable material. “As soon as you take it, you want the system to self-right so that you can ensure contact with the tissue,” said Giovanni Traverso, an assistant professor at Brigham and Women’s Hospital at Harvard Medical School in the US. Once the tip of the needle is injected into the stomach wall, the insulin dissolves at a rate that can be controlled by the researchers as the capsule is prepared. In this study, it took about an hour for all of the insulin to be fully released into the bloodstream. In tests in pigs, the researchers showed that they could successfully deliver up to 300 micrograms of insulin. More recently, they have been able to increase the dose to 5 milligrams, which is comparable to the amount that a patient with type 2 diabetes would need to inject.